After the seven teams in Group B could not agree on a match schedule for the Euro 08 tournament, a draw was made at the UEFA headquarters in Nyon today. The Faroe Islands will start their campaign with a home match against Georgia in August 2006 and will play their last match away to Italy in November 2007. 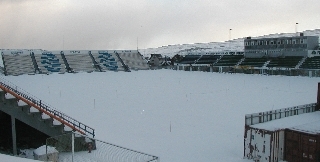 Originally, the Faroe Islands were drawn to play at home against Ukraine in March and Georgia in November 2006, but as weather conditions and bad light (there are no floodlights) make it difficult to play at those dates in the Faroes, the Faroe Islands Soccer Association has made agreements with Georgia and Ukraine to play those matches in August 2006 and 2007 instead. These two changes still need acceptance from the other countries in the Group, but most likely, that will not be a problem. And if they don’t object, then this will be the fixture list for the Euro 08 qualifying campaign for the Faroe Islands. The Faroese proposal to play the match against Ukraine in August instead of March was not accepted. The match will therefore be played on March 24, 2006. Read the full article here: Faroe Islands to play Ukraine in March 2007 – in snow? 5 of the 6 away matches will be played on a Wednesday. In the away match in Lithuania on September 12 2007, it will be exactly 17 years since the Faroe Islands burst onto the world stage of soccer, when they beat Austria 1-0 in Landskrona, Sweden in what was maybe the biggest surprise ever in world soccer. The Faroe Islands didn’t even have a Stadium to play on in the Faroes Islands at that stage and therefore played the home matches on neutral ground in Sweeden! Faroe Islands’ game in Scotland on September 2, 2006 will not be played in the National Stadium, Hampedn Park, as it is has been booked to stage a sellout Robbie Williams consert. Shetland has told the Scottish Soccer Association that they are more than welcome to stage the game in Shetland, but the Scotts are most likely to choose Ibrox or Parkhead. Pittodrie Stadium in Aberdeen is also an option, as Scotland took on the Faroe Islands there in October 1998 in a EURO 2000 Qualifier.